i am a big fan of eggs. i really like eggs (like really, really). why am i writing a post on eggs? because eggs are important to my existence as a living being, and i believe they deserve to have a post dedicated to them. also, let's get down to some scientific business here. eggs are super duper rich in vitamins, nutrients, good fats, and protein. they contain all 9 essential amino acids, and minerals and nutrients like iron, phosphorous, selenium, and vitamins A, B12, B5 and others. in other words, eggs are a superfood that don't contain the words "acai," "spirulina," "grass," or "baobab." nice. eggs come in all forms in recipes, so i want to share with you my favorite things to do with this beloved ingredient. shakshuka (especially from greenkitchenstories) is both an eggs-for-dinner and dinner-for-breakfast sort of dish. it's a good share (or just eat entirely by yourself) food. so in other words, it's pretty great for basically anything you want. these simple scrambled eggs. there is little known to me that is as great as simple scrambled eggs. this recipe has a few extras that make the scramble so, so fluffy. aka the best scrambled eggs ever. i'm pretty sure you know of izy. her baked eggs with spinach, ricotta, and leeks is one of my favorites for a lazy sunday brunch. like the shakshuka, these eggs are great for sharing, but also great for some solo breakfast-ing. RICOTTA is always the answer. this french toast is indeed eggy and fancy. heck, throw in some orange zest on top and you got a fancy one-fourth of a four course breakfast. 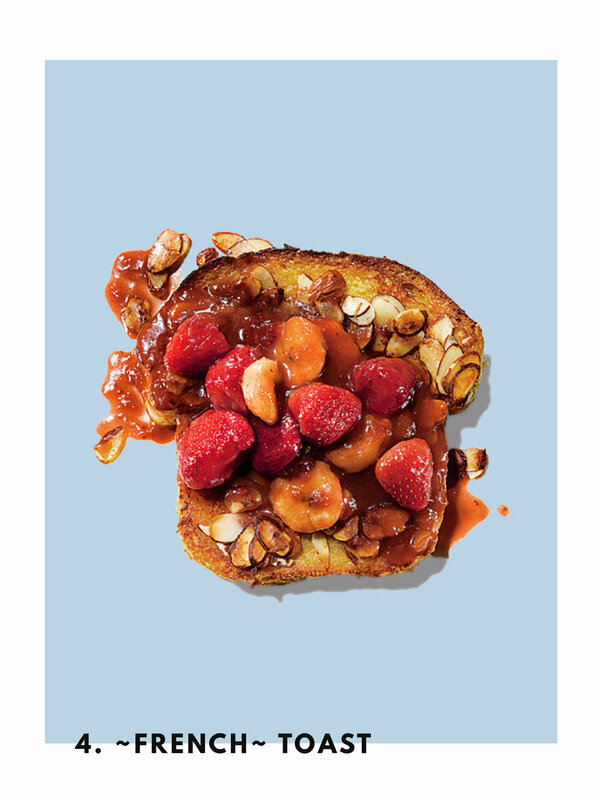 the roasted almonds give this toast a nice crunchy finish. so, i dig it.